One of the first great zombie movies, White Zombie was released in 1932 and shows its age in some notable ways. Viewers may notice that there is a lack of music in sequences where people are talking. This is because in many early sound films directors believed that music tracks distracted from the dialogue. White Zombie did use music in sequences that don’t have dialogue, making it more like a modern film than Universal's Frankenstein movies which relied almost entirely on dialogue and ambient sound. Also interesting is that the film utilizes the traditional voodoo origin of zombies rather than the more modern “zombie plague” concept. Here, they are controlled by an evil plantation owner played by Bela Lugosi. The film’s haunting atmosphere, unique Haitian plantation setting, and Lugosi’s mesmerizingly malevolent performance make up for the weak performances of the actors playing the protagonists. Unlike the other films on this list, Plan 9 from Outer Space is sort of a comedy rather than a horror film, although director Edward D. Wood was clearly aiming for something more serious. From a hilarious opening where a psychic claims the film was “based on sworn testimony” to watching zombies nearly knock over the cardboard gravestones on set, Plan 9 betrays its extreme low-budget origins early and often. The saga of an alien invasion in which the invaders attempt to take over Earth by using technology to resurrect three zombies, Plan 9 is the kind of movie that has not only the gall to represent a “flying saucer” as a literal plate on a wire, but also to compose entire battle scenes of stock footage from World War II. The DVD also features a documentary that provides insight into Ed Wood’s career as a director of laughably low-budget movies, explaining Plan 9’s place in his overall career - it was actually one of his better made films! Many people have seen the film I Am Legend, but this earlier adaptation is much closer in tone and plot to Richard Matheson’s original novel. Vincent Price gets to play the hero character here, rather than the more typical antagonist roles he played in most horror films. In a stylistic choice that was becoming increasingly rare for 1960s films, this movie was shot in black and white, which lends a sense of loneliness and foreboding to the last man on earth’s quest for survival in a world of creatures that have lost their humanity thanks to a plague. Matheson’s story was perhaps the first telling of the “zombie apocalypse” plague, which would go on to replace the earlier voodoo concepts as the standard explanation for zombie origins. Most notably, this film actually retains the original twist ending of Matheson’s story, rather than replacing it with a Hollywood ending as the Will Smith film did. 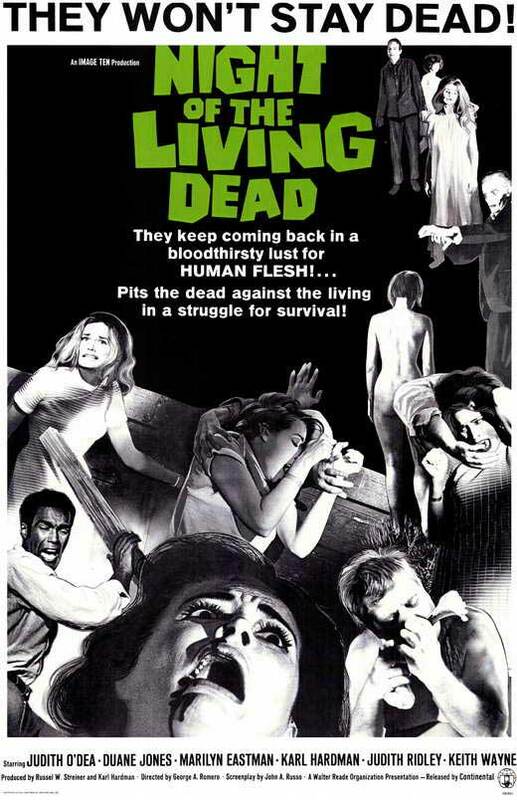 Night of the Living Dead was one of the first explicitly violent horror films produced in North America, and as such attracted a great deal of controversy when it was first released. The movie is the archetypal modern zombie film, featuring a group of survivors forced to hide and defend themselves in a house from a seemingly endless zombie onslaught. George A. Romero, the director of Night, used interesting and rather simple tactics to simulate the horror within the movie. When the zombies are eating bodies, they were actually eating roast ham covered in chocolate sauce. The filmmakers joked that it was so nausea-inducing, that it was almost a waste of time putting the makeup on the zombies as they ended up looking pale and sick anyway. This was one of the last notable films made in black and white, which lends a stark atmosphere to the limited and claustrophobic setting, as the living characters rarely venture beyond the house. Many people have seen the film, some without even realizing that it was based on a popular novel. The film had a long and troubled production, during which many changes were made to the script to the point that it was very different from the novel it was based on. The novel does not have a single central figure but is a “survivors’ narrative” based on the accounts of multiple narrators around the world. The zombies of the novel are the classic “slow” zombies and behave much more like the zombies in the Romero film than the film’s zombies. The movie zombies behave like literal driver ants rather than figurative ones. Even if you’ve already seen the film, it’s strongly recommended that you also read the novel, just so you can see how different it is from the source material! These titles will provide the viewer a good synopsis of how the zombie genre has evolved over the decades. Watching the zombies evolve from tortured souls plagued by voodoo to the carnivorous apocalyptic ghouls of the modern age is a compelling look at how the horror genre - and how audiences respond to it - has changed over time.